You typical cast iron turbo manifold or also known as a log manifold (as shown on the left) is usually found on most engines out there as they are an oem part that come standard on most production turbocharged cars, tubular turbo manifolds are after-market manifolds typically for adding a turbocharger to your engine or upgrading / replacing you old manifold. Both manifold types do have pros and cons, for example cast manifolds are extremely strong and durable and tubular manifolds (especially the cheap eBay ones) crack very easily due to the thickness of steel, quality of the steel, fluctuation of heat and vibrations. 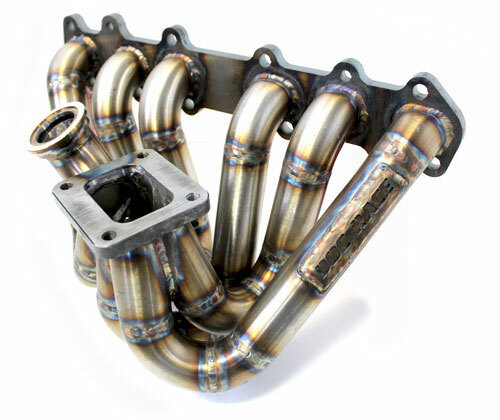 It has always been a general rule with any exhaust manifolds / turbo manifolds that tuned length pipes will give you the most amount of power available from your manifold, a lot of tubular turbo manifolds will do this easily where as this really can’t be achieved on cast due to the thick and bulky design. 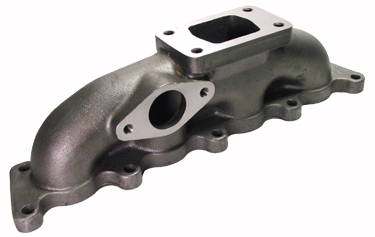 Custom Designed Manifolds can be made with tubular steel, so when your pressed for room in the engine bay you can always get tubular manifold fabricated to suit your application, this can’t exactly be done with cast iron material unless you know someone who has cast production factors and thousands of dollars of tooling at there dispense. Customising an existing manifold can prove to be a challenge with cast material, trying to add a external wastegate port or or change your factory ct26 flange to T3 is quite expensive with cast, but is quite easy with tubular steel. Now with boost the biggest killer is heat soak, so keeping those temperatures down in you engine bay is very important, a hot engine bay = hot piping = warmer air = less power = more detonation, cast manifold are relatively good at keeping in the heat and work even better with nice thick heat shield covering them also, this can be a pain in the muffler when you try to remove that manifold and all the studs / nuts have seized but that is why got created WD40. Tubular manifold look great in the engine bay and even better when covered in heat wrap but they tend to throw our a lot more heat than cast manifolds. In reality it depends on your application and what you prefer, for me I tend to stick to cast for durability and less heat soak but if I needed a custom manifold I would use tubular if not flange adapters would suit, not to mention cast also looks stock so it doesn’t stand out in the engine bay to the 5 – 0 to pick on.